Team Suzuki rider Josh Waters made an emphatic return to Viking Group Australian Superbike Championship competition this afternoon, winning the opening 20-lap Symmons Plains race and breaking the lap record in the process. The closing stages of the race saw an entertaining five-rider battle play out, with the positions changing lap after lap as riders dove deep under brakes from the 270km/h back straight. Polesitter Team Honda’s Wayne Maxwell and Procon Maxima BMW’s Glenn Allerton both had turns in the lead, but the Suzuki of Waters soon came on strong and his pace proved tough to match. Before his pass for the lead on lap 16, Waters set about re-writing the record books, lowering the best race lap mark to 53.475. He resisted the final corner challenge of Maxwell to win by 0.048 seconds, scoring maximum points in his first race of the 2011 championship after missing round one with World Superbike duties. “I couldn’t have asked for a better result for my first race,” said Waters. “I didn’t get a great start but knew the bike would be strong so kept at the leaders. “I was able to get by with a few laps to go and from then it was a matter of riding smart. Allerton faded after leading for 5 laps early in the piece, but recovered to finish third. Team Suzuki’s Troy Herfoss and Team Honda Racing’s Jamie Stauffer were both in the podium picture but were muscled back late in the race, finishing fourth and fifth respectively. The second 20-lap race will be held at 3.40pm this afternoon. Supersport pole-sitter Christian Casella took victory in the category’s opening 20-lap race, taking advantage of a first-lap stoush between brothers Brodie and Nick Waters. Points leader Aaron Gobert was also involved, taking the pressure off the Triumph-mounted Casella who headed home Yamaha’s Kevin Curtain. Procon Maxima BMW rider Glenn Allerton has extended his Viking Group Australian Superbike Championship points lead with a dominant race win at Symmons Plains this afternoon. Hindered by a brake problem in this morning’s race, the 2008 Australian Superbike Champion bounced back in style in the second 20-lap stoush, winning by a 1.444-second margin over Team Honda Racing’s Wayne Maxwell. Maxwell took the lead from pole and controlled the race until mid-distance when Allerton pounced, the power of the BMW S 1000 RR only too apparent on the back straight sweeper, the fastest corner in Australian motorsport at over 270km/h. Today’s result also marks Allerton’s third round win in a row. He won here in November last year before switching manufacturers and dominating last week’s Phillip Island opener. The Sydneysider said he was determined to make amends for this morning’s race where he felt a win went begging. “I felt really comfortable on the bike today,” said Allerton. “The problem with the front brake in race 1 cost me a chance to attack and I knew I had to make it up this afternoon. “We pulled together as a team and got it done, thanks to everyone involved for a huge effort this weekend. Allerton leads the championship on 93 points, 23 ahead of Team Suzuki’s Troy Herfoss who finished fifth overall this weekend. Second place for the round went to race 1 winner, Team Suzuki’s Josh Waters. Waters was unable to match the pace of Allerton and the Team Honda duo this afternoon and has already set his sights on Hidden Valley, a track he dominated at last year. “I was really happy with the race 1 result but today I didn’t quite have enough for the leaders in race 2,” said Waters. Wayne Maxwell finished third today, adding a valuable 41 points to his tally. The top three were separated by a point each at the conclusion of a thrilling day of racing. Spectators were treated to a second incredible QBE Supersport race this afternoon, with Team Suzuki’s Brodie Waters emerging the victor, a result that could have gone to any one of the five lead riders. Eager to make amends after this morning’s mishap, Sunstate Racing’s Nick Waters took the early advantage but soon found himself under fire from four more evenly-matched machines. The lead changed almost every lap as riders dared to dive further and further under brakes in the final complex of corners. AARK Racing polesitter Christian Casella and the Yamaha Racing Team’s Kevin Curtain had their time at the front but Brodie Waters prevailed with an advantage of just 0.059 seconds. Waters, who limped to ninth after crashing into brother Nick in the opening 20-lap dash, praised his team for providing such a competitive race bike. “I knew I had to make up for this morning’s mistake and the team put everything they had behind me,” said Waters. It was a triumphant weekend for Casella, who won the opening race, the round, and takes a 1-point lead in the championship. “It was a pretty hectic race,” said Casella. “There’s some big braking areas around this track and everyone was having a big go, it was a bit like the Superbike race, a real flip of the coin as to who’s going to get there in the end. “To be honest I’m pretty happy to be still sitting on the bike after that one, it was pretty crazy! Cru Halliday rode his Yamaha R1 to two Prostock race victories today, and, combined with his pole position and race 1 win yesterday, leaves Symmons Plains with maximum points. Matthew Walters edged out Linden Magee by a single point today to claim second for the round. Brett Simmonds was the highest finishing Tasmanian rider this weekend, placing fourth overall in the competitive Prostock category. Mike Jones’ perfect points haul continued this weekend, with the Yamaha rider securing pole and three race wins from as many starts. Mirroring his round win from Phillip Island last weekend, he now has a substantial lead in the Suzuki Superstock class, 34 points clear of Mark Wilkinson in second. Zack Thackeray rounded out the top three in the class today, with this weekend’s results reflecting the top three in the championship. The Motul Superlites class saw Josh Hook also in fine form, dominating races 2 and 3 today to take maximum points and a clear round win over Nicky Diles and Alex Phillis. Hook leads fellow Aprilia rider Diles by 16 points heading into round 2. The next round of the Viking Group Australian Superbike Championships will be held at Darwin’s Hidden Valley Raceway from April 14-17. Procon Maxima BMW rider Glenn Allerton has extended his Viking Group Australian Superbike Championship points lead with a dominant race win at Symmons Plains on the weekend. Hindered by a brake problem in race 1, the 2008 Australian Superbike Champion bounced back in style in the second 20-lap stoush, winning by a 1.444-second margin over Team Honda Racing’s Wayne Maxwell. The result also marks Allerton’s third round win in a row. He won here in November last year before switching manufacturers and dominating the Phillip Island opener. The Sydneysider said he was determined to make amends for race 1, where he felt a win went begging. Procon Racing Team owner Wayne Hepburn was very pleased with the teams efforts over the weekend, “Glenn rode a brilliant race, especially considering the issues he had in race 1 with the front brake. To make adjustments on the fly and come back through the field was amazing, the crowd were on the edge of their seats, one more lap and I am sure he would have taken the win”. BMW Motorrad Marketing Manager, Miles Davis just equally as pleased. “We are thrilled with Glenn’s results of late. He is a true champion and he has a great team around him. To be leading the championship with very little time to prepare the bike is almost unbelievable; it also shows how good the S 1000 RR is straight out of the box. Glenn and Procon Racing have definitely proven that they are genuine championship contenders”. Another clean sweep by Reece Bancell Scholarship rider Mike Jones has set the paddock abuzz with the way in which Mike goes about his racing – Very professional, very fast and smooth. Mike will NEXT be racing at round 1 of the AFX-SBK Championships at Eastern Creek, NSW on 11 – 13 March. Christan Casella had a stunning weekend at Symmons Plains Raceway in Tasmania this weekend past, not only taking Superpole on his Triumph Daytona 675 Supersport machine, but also scored 1st place in race I and second in race 2, giving him the round win and is currently sitting in 1st place in the series on 77 points. Christan also set the fastest lap time of the weekend in the Supersport Class at 56.339 Seconds. “After taking Superpole I was super confident that I could take it to them and end up with a podium. To take out the round win was awesome. The second race was a real battle of wills, with more than a little paint being swapped amongst the front runners. I settled for a safe second place, knowing that it would give me enough points to take the round win” commented Casella. Next round is on 14-17th April at Hidden Valley in the N.T. Gobert Motorsports Yamaha’s Aaron Gobert raced through a spell of bad luck at Symmons Plains’ second round of the Australian Supersport Championship on 3-6 March to finish sixth overall and maintain third in the series. After capturing victory at the opening round just one weekend prior, former American national champion Gobert experienced mechanical troubles during practice and was forced to revert to his lower-spec number two engine for the round. Despite working around the clock to prepare his privateer YZF-R6 for Saturday’s qualifying, Gobert was able to qualify sixth and then went on to finish sixth overall with 6-7 results on Sunday. The opening 20-lap Supersport stoush saw a determined Gobert recover from an opening lap incident that forced him to the rear of the field, slicing his way through the pack to claim sixth. Later that afternoon it was another hard-fought race for Gobert, scoring a consistent seventh after being forced to contest the race on a pre-used Dunlop control tyre that he’d already lapped on during qualifying. “We tried really hard to be consistent after the tough time we had on Friday,” Gobert explained. “We had to run with our back-up motor, which isn’t quite as good as our primary engine that we usually race with obviously. The series will now head to Hidden Valley for round three of six in the Northern Territory on 14-17 April, where Gobert will be looking to return to the winner’s circle for the second time this season. In what can only be described as an action-packed day of racing for spectators at Symmons Plains Raceway Team Honda racing comes away from Round two of the Australian Superbike Championship with valuable championship points; Jamie Stauffer now in 3rdplace in the championship and Wayne Maxwell in 5thplace. Both riders showed their prowess on the track as #47 Wayne Maxwell took his second Superpole point of the season to start both races in P1 and #27 Jamie Stauffer recorded the fastest ever lap at Symmons Plains Raceway with a 53.271 sec in the second qualifying session on Saturday. The new team is going from strength to strength after only two rounds of the championship and have made enormous progress in their bike development. Race 1 – This was definitely a nail-biter for Team Honda Racing as Maxwell led from Stauffer for a number of laps, looking extremely comfortable onboard their CBR1000RR’s. However, as Stauffer was challenging Maxwell for the race lead, his CBR1000RR had a front-end slide and unfortunately this forced both himself and Maxwell wide of the race line. With the field so close both Honda riders lost valuable places and Waters was able to go through to the lead and take the win. In a valiant recovery, Maxwell finished 2nd just .048 sec behind Waters with Stauffer finishing in 5th place. Race 2 – This was equally as tense for Team Honda Racing as once again Maxwell and Stauffer got off the start line in spectacular fashion from their P1 (Maxwell) and P4 (Stauffer) grid positions and Maxwell led the race for 14 laps. Stauffer battled with Allerton for 2ndplace, however in the final laps, Allerton took the lead and Maxwell went across the finish line in 2ndplace with his team mate Stauffer in 3rd. Overall with another Superpole point to his name, Maxwell had a strong weekend, finishing 2ndin both races and 3rdfor the Round, he is positive about the weekend’s results. Stauffer now sits third in the championship overall after taking a 5thand a 3rdplace in the weekend’s races and says he feels the CBR1000RR needs only minor adjustments to put it in a position to take the win in Darwin next month. Team Principal Paul Free is proud of his team even though the race win eluded them this weekend. Mildura rising star Nicholas Waters has claimed his maiden Australian Supersport Championship race podium with a sterling third place in the second and final outing at Symmons Plains in Tasmania on Sunday. The Waters Racing/Sunstate Racing Suzuki rookie qualified an impressive fourth fastest in Superpole on Saturday, however an opening lap incident with elder brother Brodie dashed his hopes of a top result when he was forced to retire from the opening race of the weekend. Waters was involved in race two’s spectacular five-way fight for victory, and after 20 hard-fought laps he was able to clinch third behind Team Suzuki’s race winner Brodie and overall round winner Christan Casella. “It’s great to finish in third in race two and I can’t say enough about my suspension technician Steve Mudford of Technical Partners – he has my GSX-R600 hooked up on rails now,” the 17-year-old commented. Waters enjoyed a breakthrough weekend in Tasmania, which was just his third ever national Supersport event, finishing just 0.780sec off his victorious brother in race two – leading his first ever lap on the sixth of 20. Despite his DNF in race one, Waters finished 12th overall for the round and is now focused on improving his 11th position in the series as the series heads to Hidden Valley in the Northern Territory on 14-17 April. 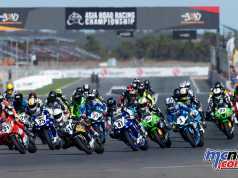 Yamaha racers again put in top shelf performances at round two of the Australian Superbike Championships (ASBK) held at Tasmania’s Symmons Plains on the weekend. Fresh from standout performances at the opening round at Phillip Island, the blue squad was determined to keep the momentum rolling and take up as much podium space as possible on a cool afternoon in Tasmania. Rick Olson picked himself up after last weeks’ disappointment at Phillip Island and promptly parked his Yamaha R6 on the podium at Symmons Plains in the Supersport 600cc division. Olson put together two consistent races to finish with 3-4 scores in the two race format and round out the day in third place. Despite the DNF (did not finish) in the second race at Phillip Island, the weekends’ results has seen Olson climb to sixth on the points table after two rounds and well within striking distance of a podium finish. The day wasn’t as good for teammate Kevin Curtain. Curtain took second place in the opening race at round two and looked to be on track for another podium filled day at the office. But in the waning moments of the second race and with a top three finish within his grasp, Curtain came off his R6 and was unable to finish the race. The 2-DNF scores left him in 11th for the round and he now sits fifth in the point standings. Yamaha riders also continued their dominating display in the support classes with Mike Jones taking all three race wins in the Superstock 600cc class. Jones also smashed the lap record as he raced to victory for the second weekend in a row. Cru Halliday also turned in another head turning performance, matching Jones and also taking all three race wins in the Pro Stock 1000cc class. 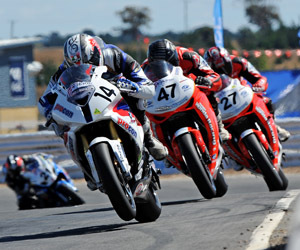 Halliday continues to improve each and every weekend and is seen as one of the rising stars of Australian road racing. “Also the form of Mike Jones and Cru Halliday is outstanding at the moment and both are riding well and deserve their position at the front of their classes,” Redding finishes. 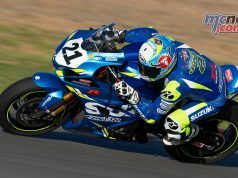 Team Suzuki rider Joshua Waters marked his debut in the 2011 Australian Superbike Championship with a new lap record and a race win at the second round of the championship at Tasmania’s Symmons Plains Raceway on 4-6 March. 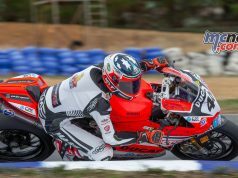 Waters, who missed the opening round of the national series at Victoria’s Phillip Island Grand Prix Circuit on 25-27 February due to â€˜wildcard’ commitments in the Superbike World Championship, won Sunday’s opening 20-lap race by 0.048sec from Wayne Maxwell and Glenn Allerton. In one of the most exciting Superbike races in the championship’s 22-year history, just 1.469sec covered the top five riders when the chequered flag was waved to signal the end of race one. Waters, the 2009 Australian Superbike Champion, claimed a new Superbike lap record of 53.475sec on his way to victory on his Team Suzuki GSX-R1000, and then backed up in race two with a hard-fought fourth place, just 0.418sec behind third-placed Jamie Stauffer who in turn was 0.087sec behind second-placed Maxwell. The Team Suzuki rider’s win and fourth placing gave the 24-year-old second overall for the round, one point adrift of round winner and race two victor Allerton. Just outside a podium position in race one was Team Suzuki Superbike rookie Troy Herfoss, the 2010 Australian Supersport Champion finishing a close fourth on his Suzuki GSX-R1000 in what was only his third race on a Superbike. Herfoss backed up in race two with fifth place to consolidate second overall in the championship standings. Three-times New Zealand Superbike champion Robbie Bugden finished seventh overall after carding sixth and seventh placings on his Team Mack Trucks Suzuki GSX-R1000 as he continues his return to race fitness after fracturing his leg just over two months ago. GSX-R1000 repeatedly hit 270km/h around Symmons Plains’ daunting Turn Five â€˜kink’, the fastest corner in Australian motorcycle racing. After two rounds Allerton leads the eight-round Australian Superbike Championship on 93 points, 23pts ahead of Team Suzuki’s Herfoss with two-times Australian Superbike Champion Jamie Stauffer third on 66 points. Waters, in his first outing in the 2011 Australian series, now sits tenth on 42pts. In the Australian Superpsort Championship Team Suzuki GSX-R600 rider Brodie Waters moved to within one point of the championship lead after finishing second overall for the round. Eighteen-year-old Waters won the second of the two 20-lap Supersport races by 0.059sec from race one winner Christan Casella, but had his chance of victory in race one scuppered on the opening lap when a missed gear-change caused a first-lap crash at the Turn Four hairpin. Waters, who collided with his younger brother Nicholas’s Suzuki GSX-R600 in the incident, remounted his damaged bike to gather 12pts for a gritty ninth place. Casella took the overall round win with first and second in the two 20-lap races and leads the Australian Supersport Championship by one point from Waters, 77 to 76, with Aaron Gobert third on 71pts. The next round of the Viking Group Australian Superbike Championships will be held at Darwin’s Hidden Valley Raceway on April 14-17. “It’s been a great weekend for Josh in his return to the ASBK, and for Troy too in only his second race meeting on the Superbike. “They were two of the best Superbike races you could ever wish to see – nobody gave an inch, so for Troy to run with those guys in what is only his third full season of road racing is impressive. “It was hard but clean racing between all five riders – Josh, Troy, Glenn (Allerton), Wayne (Maxwell) and Jamie (Stauffer). Josh really deserved his race one win – and the lap record capped things off. “Brodie was disappointed with what happened in race one in Supersport, but he bounced back in race two in the best way possible. He rode the spare bike in race two, as the number one bike was damaged in the race one crash. “That first race win was a big turnaround to how my weekend started. If you’d asked me on Friday if I thought I’d be on the podium I would have said no chance, as I was struggling to adapt after racing the weekend before on the World-spec GSX-R1000 Superbike and different tyres. “But my team kept working on the bike, and I spent some time talking to Shawn (Giles) and I was able to get my lap times down. My bike was really strong under brakes. “I’m happy with the results in the two races and happy with how the weekend went – but I don’t like finishing only 1.3sec behind the race winner and ending up fourth. They were two close races, that is for sure. “The bike was great and the team gave me a package that could run with the front guys. “The win in race two was a good way to finish the weekend. My plan was to get to the front and do consistent laps, but the pace was pretty hot. “I guess I’m fortunate I was able to get some points in the first race. I got a false neutral and just couldn’t stop for the hairpin. “My left foot-peg got broken when I crashed, so it was hard to ride the bike, especially around the Turn Five sweeper – I had my boot resting on the heel guard. “They were two tough races and I had some great battles with Ben (Attard) and Craig (Coxhell). My bike had the pace but I was struggling a bit with my injured leg. Given the circumstances, I’m pretty happy with the results. Bendigo Motorcycle rider Mark Wilkinson took and impressive 2nd Overall in Round 2 of the Australian Superstock Championship in a difficult round for the MWRacing56.com Team held at the technical Symmons Plains Raceway in Tasmania. After a 230kmh crash of Thursday practice that almost completely destroyed the teams #1 race bike, team rider Mark pushed through the pain barrier to take an impressive 2nd for the Tasmanian round and now sits in a clear 2nd place in the Australian Championship standings. Saturday morning saw the riders take to the track for the days 2 qualifying session’s. A battered and bruised Mark put in an excellent effort to take his best qualifying result of 3rd place on the grid in the Superstock class. Race 2 was staged Sunday morning, with Mark making a competitive start quickly moving into 2nd place by the end of the first lap. Mark made a break from the battle for 3rd place before fuel pump troubles slowed the MWRacing56.com machine to 3rd place finish. Race 3 Sunday afternoon began with bang as the 4 riders on the front row all battled for 1st place into turn 1. Mark was able to take the lead early, however his injuries stopped him from staying in the fight for the lead. He held onto 2nd place which is and incredible result considering the difficult start to the weekend. The first of 4 point scoring rounds in the Australian Prostock Championship took place at the fast but technical Symmons Plains Raceway at Round 2 of the Viking Group Australian Superbike Championship on April 4-6.
to Pole position, 3 race victories and a new lap record. 55.701sec eclipsing the qualifying lap record and securing the bonus point for pole position. An uncharacteristically slow start put Cru in 4th place as the field rounded turn 1 in the first of the three 11 lap races. Cru used the laps in hand and his strength and skill under brakes exiting the fast right hand sweeper on the back straight to pass his competitors 1 by 1. He took the lead and a new race lap record of 55.483sec on lap 4. He did a total of 5 laps below the old mark of 55.647sec by the end of the race, further showcasing his pace and ability to produce consistent laps. Cru got much better starts in Sunday’s two races making his job allot easier. He finished each race with a comfortable 5.5 second lead despite nearly coming to grief on the first lap of the final race in the last corner whilst pushing hard to form an early lead. Cru left Symmons Plains on a maximum 76 points with his 3 race wins and bonus point for pole position. “I knew I had to be on my game this weekend. New riders, new models and new manufactures coming into the championship this season meant that it was going to be tough. I think I proved how good my Yamaha R1 is and that I can be competitive on it.